Describing love or how you feel when you are in love can be a difficult thing but many happy couples say that they feel butterflies in their stomach when they see the person that they want to spend the rest of their live with. 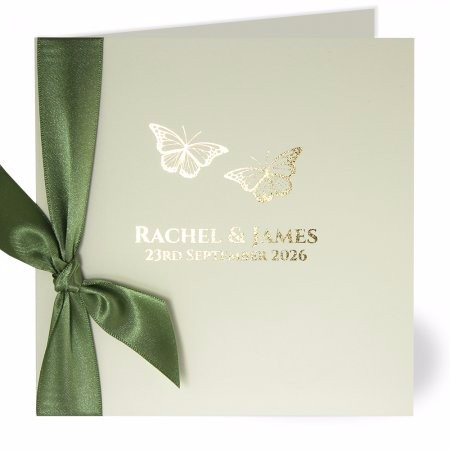 This means that butterflies are commonly associated with love and romance, making them the ideal addition to any wedding invitation. This is what the Flutter Gold Wedding Invitation uses as the basis for its design and the gold foil butterflies on the front of the card set the tone for a classy and romantic day. The card may be basic, but it is stylish and to the point. Underneath the butterflies you will find the name of the happy couple and the wedding date. The inside of the invitation provides all of the information that you need to know, so the main design has a simplistic but highly functional feel. Some people may think that this is not quite enough to grab the eye but this is why the addition of coloured ribbon to complete the look of the invitation is a perfect touch. Oversize cut lengths of ribbon, in a choice of 30 colours, come with the card, allowing you to finish the invitation off in the best possible style. There is a range of stationery packages on offer with this style, so no matter how much information or correspondence a happy couple has in advance of the big date, they can do so in a cohesive style. if your heart is a flutter in advance of the big day, this wedding invitation from Chapter One Press is the ideal way to spread the good news and all of the relevant information.